All about Quick PST to EML Conversion Process! MS Outlook is an email client that stores all the emails and others information regarding emails in PST files. Sometimes you need to convert Outlook email to a single Outlook Express file that is also one of most commonly used email client application. For PST data to EML conversion, you need a commercial tool that will help you to convert PST to EML. Quickly convert PST to .EML format. Convert PST to EML with all email properties (to, cc, bcc, sent and received dates). Preserve all email attachments during PST to .EML conversion. 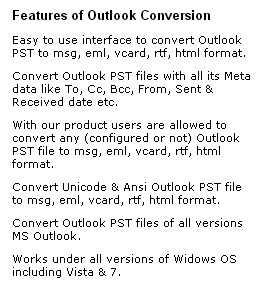 Convert PST Emails to EML of almost versions of MS Outlook (2010, 2007, 2003, 2002, 2000). Perform PST file to EML conversion for all versions of Windows OS (Win 7, Vista, XP, 2003, 2002, 98). Convert Outlook PST to EML: You can use one third-party software tool like Outlook Conversion software. This PST Data to EML converter can carry out complete and convenient conversion process from PST to EML files. We realize the value of your time, which is why your conversion needs are now meet through a single, well-designed screen which easily explain you, how to convert PST Files to EML in few simple steps. The tool helps you to carry out PST to EML conversion in batch mode also. Our PST File to EML conversion software features include the ability to convert all PST Database to EML either these are configured or not. Using this tool it is possible for you to convert PST to MSG, VCF, TXT, RTF, HTML and MHT file formats also. Download a free trial now and see for yourself. We are so much sure you will like Outlook Conversion tool that being used as PST to OE EML conversion software that we offer as full-featured tool. Only have one limitation that Demo can convert only 15 PST items at time. Further for complete PST to EML conversion, you should get the FULL version of Outlook Conversion tool only at $49.